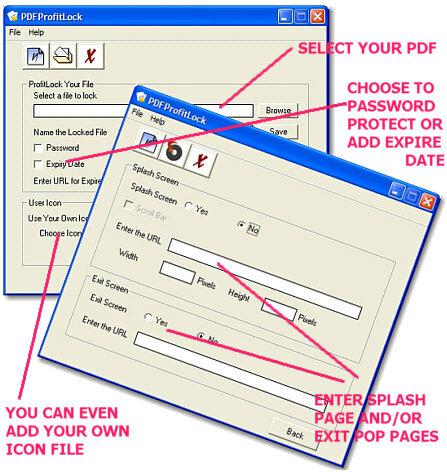 PDF Profit Lock - Set passwords & exp dates for PDF files! 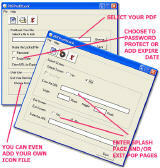 Add password protection, splash screens, exit screens, and exp dates for your PDF's! Don't let your hard work slip down the drain! PDF Profit Lock lets you add password protection, self-expiring files, splash screens, exit pop-ups...even your own icons! The Exit Screen Feature: Set this option and each time the user closes your book or report they will be taken to the URL of your choice. A great way to use this would be to send someone to an affiliate site discussed in your book. You can select to use either of these great promotional features or even both together for maximum impact of your offers. Create Self Expiring Files: Do You want to offer a free trial of your special report to your subscribers. You could offer an expiring file in exchange for a testimonial or review. Or create an ebook that is set to expire then redirect the reader to a payment link when a set date is passed. You could simply offer time sensitive information within your PDF's and have the file set to expire whenever you wish. Add Password Protection: A great security feature, create a permanent password lock for your files to make sure only those with a password will get to open them. Anyone trying to get in without authorization will get a polite 'sorry - wrong password' message and they won't be able to open the file. Choose Icon Feature: One of the best ways to improve your business is through proper branding. That's why PDF Profit Lock allows you to select your own icons to brand the file with - You can choose our default icon or use any 32x32 Ico file to make your reports recognizable as your own. PDF Profit Lock lets you add password protection, splash screens, exit screens, and exp dates for your PDF's! And it allows you to select your own icons to brand the file.